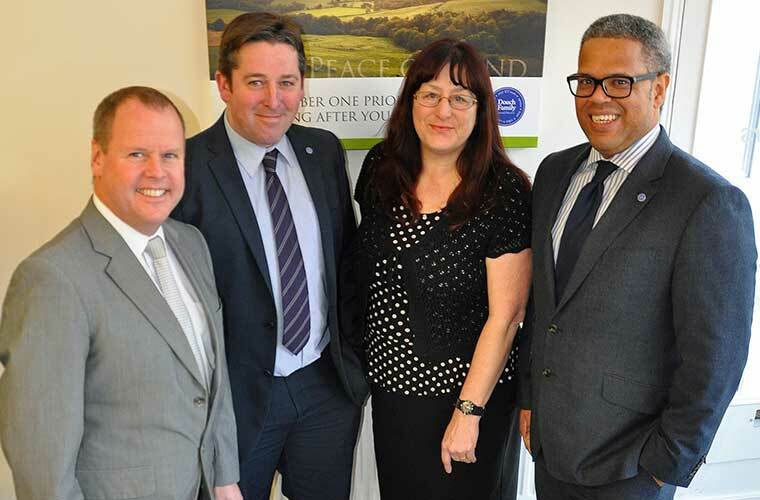 Dorset’s Douch Family Funeral Directors have recognised two staff members who have been with the company for more than 20 years each. Tina Sartain and Mark Alder were congratulated by the board, which now runs a business with eight branches across the county – more than twice the number than when the pair began their careers. A century of service. 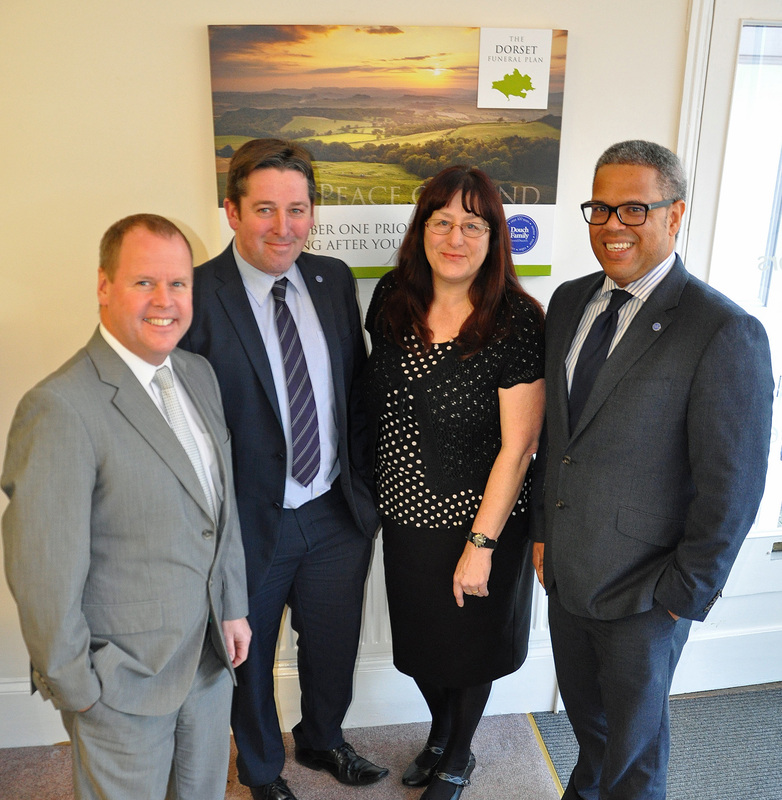 (l-r) Jonathan Stretch, Mark Alder, Tina Sartain and Nick Douch. Tina started her career as a part time bookkeeper in 1995. As her role developed she became more involved with other aspects of the business and now arranges and conducts funerals at the Douch and Small office in Wimborne. Mark began his career in 1995 as a general operative at the firm’s Albert Marsh branch in Wareham. After gaining a thorough knowledge of the business Mark started to arrange and conduct funerals in 2003 and is now branch manager of both Wareham and Upton offices. Group Managing Director Nick Douch – 18 years’ service – and company director Jonathan Stretch – 34 years’ service – understand the importance of long service in the funeral business. Nick said: “Families we deal with like continuity through the generations, which is why we put great emphasis on traditions of our branches and retaining our staff. “Behind the scenes we have embraced the benefits of modern technology, but it is our staff who make the difference and who have helped grow the company. Tina said: “I began my career as an accounts bookkeeper and was told I’d never need to be involved with funerals. One day I was on my own in the office and someone came in whose mother had died. Although not trained to arrange funerals I used knowledge gained from my colleagues and reassured and assisted the family. Mark, who manages the Albert Marsh branches in Wareham and Upton, said: “Experience and local knowledge are extremely important. “Albert Marsh has had strong links with the community for five generations and that connection as well as our high level of service is why we continue to prosper. The company has more than 60 staff, its branches are Douch & Small in Wimborne, AE Jolliffe & Son in Ferndown, Lesley Shand in Corfe Mullen and Blandford, Ives and Shand in Parkstone, James Smith in Swanage, and Albert Marsh in Wareham and Upton.